13 Marzo 2019 – W.A.P. 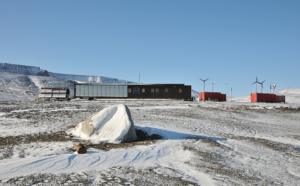 Owned by the Masaryk University, the Johann Gregor Mendel Polar Station (63°48’ 02” South, 57°52’56” West) WAP CZE-NEW is the Czech Research Station in Antarctica and bears the name of Johann Gregor Mendel, the abbot of Augustinian Monastry in Brno. In 2004, a small group of scientists and technicians set the preparation works on the northern part of James Ross Island, a land mass of approx. 2 500 km², 80% of which are ice covered; only its northern part (Ulu Peninsula) is partially ice free. The transport of construction’s material and technological units from Europe to the Chilean Punta Arenas begun by the end of 2004 and was done by the Czechoslovak Ocean Shipping company. The Chilean military icebreaker Almirante Viel did transfer everything from Punta Arenas the James Ross Island in 2005. A deep geometric survey was performed as well as the foundations of the main station building and technical containers area. The official opening ceremony took place in February 2007 and made the Czech Republic the 26th Country to have its own Scientific Base on the Icy Continent. Johann Gregor Mendel Station is located 100 meters from the sea, on free-ice land on Prince Gustav’s Channel coast. 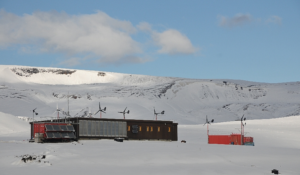 It consists of the main building for boarding and accommodation of 15-20 researchers, relaxation and laboratory activities, and of nine technical containers in the vicinity of the building, which hold storehouses, garages and the power supply generator. Currently, the Station is used in summer months, but it is open to various external projects as well. So far, no one did perform any Ham Radio operation from Gregor Mendel Station !